Despite the weather (the first time this year when it has rained heavily all day!) 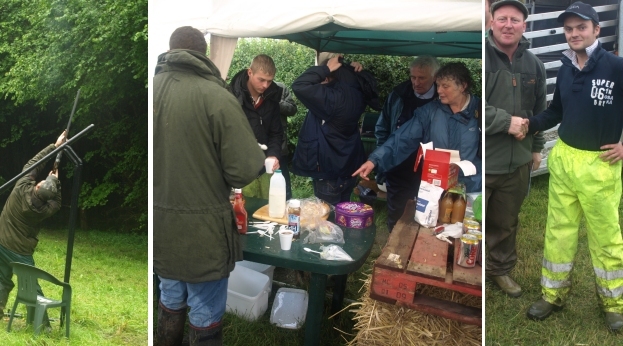 the Wincanton Young Farmers charity clay shoot managed to raise over £1000 pounds. With a good number of entries, generous support from our sponsors (see below) and hard work from club and advisory members the day was a great success. 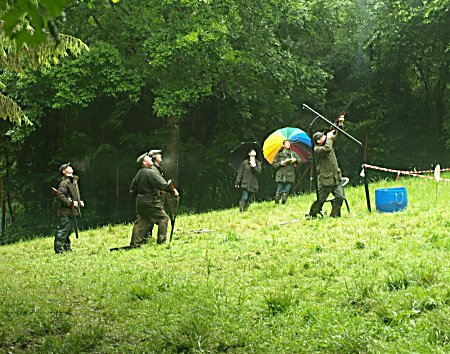 A special thank you goes to Doug, Frank, and Glenn Hodges for letting us use their excellent shooting ground at Maperton which provided challenging sporting targets in the wonderful woodland setting. Also thanks to Ray Neville, Richard Peters and Frank Hodges for their help throughout the day keeping things running smoothly. Results from the clay shoot. A rapid fire air rifle range, provided by Tower Guns, Park Farm, South Brewham, tested competitors at fast target shooting for the chance to win an air rifle. 10 shots at 10 targets with a 10 second penalty for every missed target. The winner of the air rifle was Henry Spiller with a time of 32 seconds. Thanks also to Tower Guns for providing the cartridges available for purchase on the day. This year the club are raising money for the Royal United Hospital Bath Intensive Care Unit. This has special meaning to the club as the unit cared for their late President Keith Hoskins who supported the club for many years and sadly passed away last year. Other fund raising events are planned and a presentation will take place at the Harvest Supper later this year. We would like to thank all our sponsors, listed below, for their generous support which was gratefully received. The rapid fire target range provided by Tower Guns tested shooters abilities at fast target shooting. Thanks also to Tower Guns for providing the cartridges for purchase on the day. A difficult over head shot. Light relief from the rain in the marquee for a cup of tea and a burger and Pete Dennet, receiving his prise, from club Chairman Tom Hiscock, as winner of the open class with an impressive 47 in testing conditions.